Hello readers, I'm finally back to some regular postings! After a relaxing week off from blogging, I figured an appropriate first post back would be one that centers around pampering. The Flash Rinse, 1 Minute Facial is exactly what the label reads. 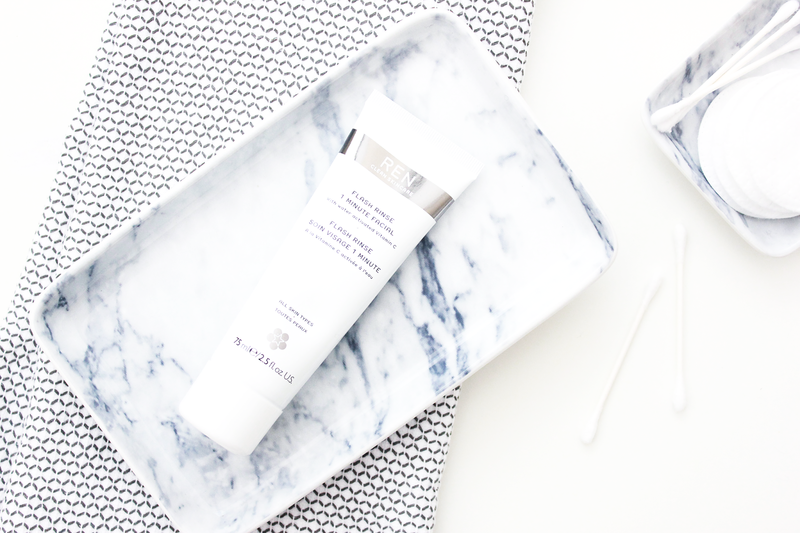 One little tube, one little dollop of product, and one minute to some pretty great skin. It's the busy girls savior. Before buying a full size tube (since it is rather pricey) I tested out a few samples from Sephora first. As my love for REN is pretty declared on this site I figured it wouldn't be long before I added the full size product to my ever growing collection. The formula is gentle and not abrasive - something I always look for. I'm not a fan of exfoliators and masks that have large beads and are rough. To apply the mask you begin with a pea sized amount and massage it into dry skin. Once applied all over, wet your finger tips and massage into your skin - this step activates the Vitamin C in the product. Let it sit for a minute and then rinse off and you're left with soft, glowing skin. Since the formula is gentle you can use this in the morning or at night and you won't be left with red skin. This is the perfect product to give your skin a boost of glow and radiance when it's feeling a bit lackluster. Have you tried it or will you be trying it? It's morning or night time treat for your skin! I swear by REN! I use the Evercalm moisturizer, Radiance serum, Cleansing Milk, 3-1 cleansing water, and the flash rinse! That's totally my biggest thing - I hate committing to a mask that stays on for a long time and then takes a lot of work to get off. This one is ideal for quick results! I cannot say enough good things about REN products! They are hands down my favorite skincare line. It definitely is mild - I agree with you on that! I prefer milder exfoliators though and only use this once a week (I use a chemical peel exfoliator as well) so for me it feels like a treat!